Downtime is one of the dirtiest words in the food processing industry. It’s because downtime is costly to us in so many ways. Downtime means you aren’t running your conveyor belts and your product isn’t moving, so you aren’t making any money. Add some perishable items to that line, and now you have wasted product that will also affect the bottom line. But perhaps the biggest consequence of downtime is missed deadlines and soured relationships with customers. But downtime doesn’t have to necessarily be a dirty word if the word “reducing” is placed in front of it. What if you could repair customer relationships by eliminating at least one source of extended downtime on your belt conveyor system? If you already have a maintenance team responsible for replacing idlers, bearings, and drives, have you considered having them do in-house conveyor belt splicing? With the purchase of endless splicing equipment and training from the crew, you reduce the need to rely on the schedule and manpower of an outside contractor, saving you time and money. Just how much money can you save? Figuring that out is as easy as averaging how much the equipment costs and considering a common emergency splice scenario. First, let’s talk about the average cost of the equipment needed to get the job done. Your crew already takes the old belt off and strings a new one. The next step is to square it, punch it, and splice it. The average cost of a portable splice press and finger punch could run you about $25,000. Now let’s talk about what downtime means to you – what it costs you every time a conveyor belt needs to be repaired. On a good day, conveyor belt repair is done during scheduled preventative maintenance time. Along with changing bearings, drives, and idlers, you’ve scheduled your service crew to install a few splices along your belt line. If your service provider charges $100 for each belt tech and it usually takes two belt techs to haul their water-cooled press in, set it up, cook the splice, and pack it up, you’ve got a $200 an hour job on your hands. If it takes about 4-6 hours to get the job done, you’re looking at $800-$1200 for that maintenance period. So a portable splice press and finger punch could pay for themselves within 20-30 splice repairs during normal PM. On a bad day, when your belt goes down during peak production, you could see as much as $10,000 an hour go down the drain in lost production time and materials. Add to that the time it takes to get an outside splice crew in and the fees (time and a half on weekends) involved and you could have a $40,000-$60,000 hit to your bottomline. In less than one period of unexpected downtime, your punch and splice press are paid in full. We’ve just calculated your return on investment in dollars and cents with real-life scenarios that put this equipment purchase into perspective. But that feeling you get when you know an emergency belt repair won’t cause you to miss a deadline and upset a customer can be even more powerful. When that customer knows you are dependable, they will keep coming back. 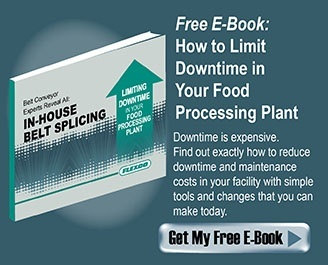 Find out more about how you can save even more time and money by downloading In House Belt Splicing: Limiting Downtime in Your Food Processing Plant. to download it today! Graves manages the overall global business, market plans, technical support, and activities associated with the light-duty belting market for the Novitool® product line, including new product development, market analysis, and global strategy. Graves holds a bachelor’s degree from Albion College as well as a master’s degree from Grand Valley State University. Air-Cooled vs. Water-Cooled Splice Presses – Which Is Best?